The mango is both delicious and nutritious and is used in a variety of dishes ranging from being served with sticky rice, as a chutney, in salads through to being part of a delicious smoothie drink; naturally enough the amount of mango calories will vary upon the individual dish. If the mango is consumed fresh by itself then it comes in at a very low calorific count of 18 calories per ounce (65 per 100g). As an average sized Mango weighs from 150g to 300g once all the skin and the central part that is not eaten has been removed then the typical calorie content is from 96 to 192 per fruit. Mango Sticky Rice served at Pier 21 in Bangkok, Thailand. As mentioned in the introduction mangos (the plural can also be spelt as mangoes) are fantastic sources of nutrients. They are especially rich in Vitamins A, B6 and C; 100g of fresh mango is enough to give 5%, 10% and 33% of these essential vitamins respectively. The fruit is also a good source of Vitamin B1, B2, B3, B9, E and K.
With regards to minerals then mangos are rich and a good source of potassium, magnesium and copper. They also contain to lower extent the following minerals calcium, iron, phosphorous and zinc. Mango fruits come from evergreen trees belonging to the Mangifera genus and are a native of the Indian sub-continent; cultivars of the Indian Mango (Mangifera indica) are the ones that are most often grown throughout the world. It is estimated that there are over one thousand different cultivars of mango. The color of the fruit varies depending on the cultivar with the yellow and orange being the most common, with green and red ones are also widely grown. In addition to using the fruit as a food source other parts of the tree also have uses. For example the leaves are often used as decorations in spiritual ceremonies. There are around 35 million tons of mangos produced per annum, with the largest producers being India (39%), China (12%), Thailand (7%), Indonesia (6%) and Pakistan and Mexico (~5% each). 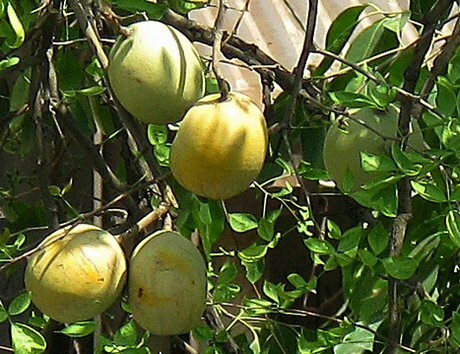 The mango is important enough to be considered the national fruits of three countries: Pakistan, India and the Philippines; and the national tree of Bangladesh. 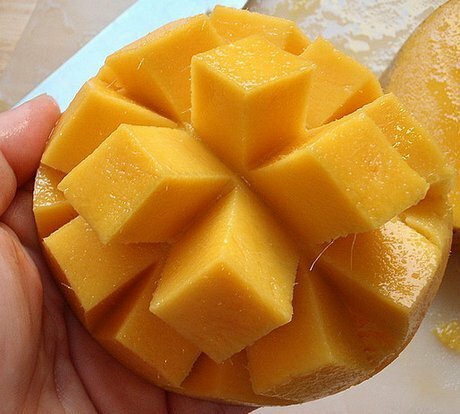 The fruit of mangos is usually sweet and full of flavor; this makes it ideal for the use in many dishes such as salads and curries, and especially in drinks such as smoothies and lassi, and deserts such as sorbet. The unripe fruits also have many culinary uses especially in the use of chutneys. As there are not that many calories in the mango fruit, and they are nutritious most of the cuisine tends to be very healthy. Making jam is a great way of preserving mangoes for year round enjoyment. Quite calorific though! Wikipedia; Nutritional Data; Health; Vitamins; Mango Calorie Photographs by Joyosity andHardeep Singh. 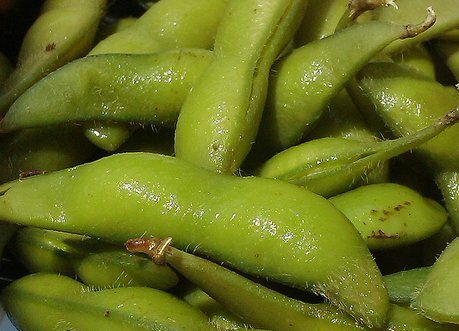 A look at Edamame nutrition, the Japanese dish of immature soybeans that are still in their pod. This dish is very often served as a side dish at the Japanese drinking establishments that are known as Izakaya. This is because it is seen as a perfect complement for alcoholic beverages. It is very easy to prepare this dish as all that is needed to be done is to boil the immature Edamame beans in salty water. The Japanese name Edamame actually refers to immature soybeans that have been cropped and still contain their branches (or twigs), though the name has often become synonymous with the Japanese dish. Soy beans are of course not only eaten in Japanese restaurants and they are very popular in other parts of Asia too. In China these young immature soybeans and referred to by the name of Maodou (hairy bean pod). The soybeans are harvested and they are still immature and in the pod. It is often the case that the end of the pod will be cut off during an operation of the Edamame beans. The Pods can then be either steamed or boiled; this is usually done with the addition of salt. Whether the salt is added to the boiling water sprinkled onto the cooked pods is down to their preference of the Cook. Once the beans have been boiled they are usually allow to cool and are often frozen. This is not always the case though and it is quite possible to eat Edamame hot. There are 122 calories in at 100 g serving of Edamame. In imperial measures this represents 34 gallons per ounce. Nutritionally Edamame is considered to be a very healthy food as it is very low insults such as sodium, yet it is a rich source of proteins, dietary fibre and many essential vitamins and minerals. Edamame is particularly rich in folate and vitamin K. If one was to eat 100 g of these beings then you would receive over 78% of the recommended daily allowance of folate, 10% of vitamin C, and 33% of your vitamin K needs. In addition to these vitamins site is also a rich source of riboflavin and thiamin; with 100 g containing about nine and 13% of the RDA respectively. In addition to being a rich source of vitamins this vegetable is also high in many minerals, especially in manganese. 100 g of Edamame contains over 50% of the recommended daily value of manganese requirement. Other minerals that they are a rich source of include copper (17%); magnesium (16%); iron (13%); potassium (12%); zinc (9%); and calcium (6%). All in all, the high concentration of minerals and vitamins in Edamame makes it a very healthy source of nutrition. We have seen above that the edamame nutrition levels of certain minerals and vitamins have very high, but what about fiber and proteins? Well if you are a fan of eating soy beans that you will be pleased to know that this vegetable is very high in proteins and eating 100 g of these per day will represent over 22% of your daily needs for proteins: this makes it an ideal source of protein for vegans and vegetarians. Edamame contains a large quantity of the amino acids: aspartic and glutamic. The news is just as good as far as dietary fibre is concerned, with 100 g of Edamame containing around 21% of a person’s daily needs of fibre. There are approximately 10 g of total carbohydrate in a 100 g serving and approximately 5 g of this is dietary fibre. These soybean pods will hopefully become delicious Edamame one day. The following table contains information on the major Edamame nutrition protein, vitamins and nutrients. Information is also given on the carbohydrate and fat levels that are found in this legume. Are Edamame Beans Good For You? From reading this article it is easy to see that Edamame is a very good source of nutrition. In addition to being rich in dietary fibre and minerals such as manganese and calcium it is also a very good source phytoestrogens and Omega-three fatty acids. As they are very low in calories they make an ideal snack for when one is feeling a little bit hungry, and as they are a rich source of vitamins they make it much healthier (and often more tasty) option for you than eating a confectionery snack. Many people are curious about a product made out of soybeans that they find at Japanese restaurants. They want to know what is edamame? In what ways it is good for them? and so on and so forth. In this section we will satisfy any curiosity you have about this amazing product. First of all though, we think it is important that you know how to pronounce it. We will break down the edamame pronunciation by its four parts. First is ed as in the name Ed. Then a is in uh. Third is ma as in mama. And lastly, the me part is pronounced like May. There you have it. Now, let’s get into the particulars of edamame. Edamame is a soybean, frequently found in Hawaii and parts of Asia like Japan, China and Korea. The thing with edamame though is that is not quite full grown and is still inside of the pod. Many different methods are employed in the cooking of edamame, with plain salt being the most common of them. Many people even make the edamame dry roasted, which is said to have a very appetizing nature. The edamame beans have several beneficial features which appeal to those looking to stay healthy and control their weight. They are quite low in both fat and cholesterol. And another plus is that there is no sodium or trans-fat present in them. Additionally edamame beans have very low levels of sugar and are quite high in fiber. People love them because they can also be eaten as snacks when one is in a hurry and on the move. They are also welcome additions to a number of meals. They can be used in salads and just about any kind of stir-fried meal. Edamame is increasingly found in trail mixes as well, whether the mix is homemade or store-bought. Most people at first glance think of edamame as being a nut when in fact it happens to be a vegetable. It is loaded with nutritional value similar to that of most other varieties of beans though, and is especially rich in minerals such as iron and calcium; proteins; and fiber. The area of protein is where edamame beans really stand out. In fact, at 68 grams per cup, they have the highest level of all members of the bean family. There are many more ways that these fantastic soybeans can be used. Perhaps, the most popular way of all that edamame beans are consumed is straight from the bag. Try them and see. We think that once you do you too will join the edamame craze too. Those who have a restricted food diet such as those following the vegetarian diet, or an allergy to lactose likely know many things about edamame beans because they get many of their nutrients from products that are made out of soybean. These include drinks that are made out of soybean like soy milk, as well as consumption of the bean in the Japanese edamame style. Soybean products are thought to be very healthy and they are a good source of calories that are often needed by those following a strict vegan diet. It is known to be a good source for proteins and carbohydrates that are not readily available for vegetarians and vegans among others.Antioxidants and vitamins A, and C, can also be gained from edamame or soybean products. There are many other nutrients that one can get from edamame beans. These include antioxidants, vitamins, calories, proteins and carbohydrates; furthermore, there is also a lot of fiber in soybeans. This is one kind of food that people should not miss out on Edamame is thought to provide one who eats or drinks products made from it healthier, and better able to avoid various diseases. 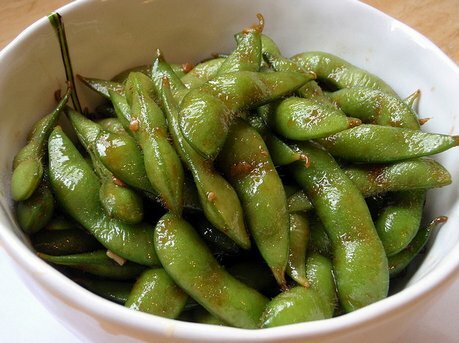 One thing that edamame is known for is the protein that it contains. Its protein is said to help people protect themselves by controlling the rise and fall of insulin, and it is quite valuable to people with diabetes. It also helps in the prevention of damage to the kidneys. Studies have been conducted about the effects of the protein from soybean on the body and there have been many cohort studies that have linked the legume with limiting diseases that plague some people when they are sick with diabetes and the likes. In a Chinese University, soy protein that contains isoflavones or phytoestrogens has been demonstrated to reduce the LDL cholesterol or the bad cholesterol in men. Edamame nutrition is therefore important for those who have problems with bad cholesterols. In addition to lowering the level of LDL cholesterol in men, and perhaps some women, it increases the good cholesterol or HDL, too. Healthy cholesterol levels are attained by men and women when they are given the nutrition of this kind. It is therefore considered healthy to drink some products that are made out of soy on a daily basis. Development of diseases like cancer, osteoporosis, and some heart diseases can also be positively impacted when one includes legumes such as edamame in their diet. 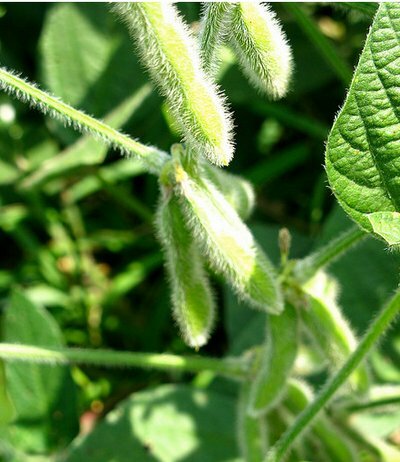 The protection against these diseases comes largely from the isoflavones or the phytoestrogens that are found in the soybean. Those who are at risk for these diseases would definitely benefit from including edamame in their diet. Edamame bean nutrition can be gained from both the pods, and the shelled kinds, that can be found in the supermarkets today. Soybean can be eaten like finger food once it has been thawed out from the freezer; if not eaten fresh. The shelled kind can also be used when cooking food such as rice dishes, or in salads; you may even enjoy them in a dry roasted edamame form. There are definitely many benefits that one can get from eating this legume. Information for this site has been sourced from NSRL; Purdue; Wikipedia; Washington State University Extension; and the USDA. Edamame photographs on this site courtesy of Flickr creative commons are by Joyosity, NRCS SD, David DeHetre and mamamusings. The body is in need of the mineral iron in order to produce hemoglobin and myoglobin. The oxygen-carrying red colored protein found in blood cells is known as hemoglobin while myoglobin is the protein responsible in carrying oxygen in muscle cells.